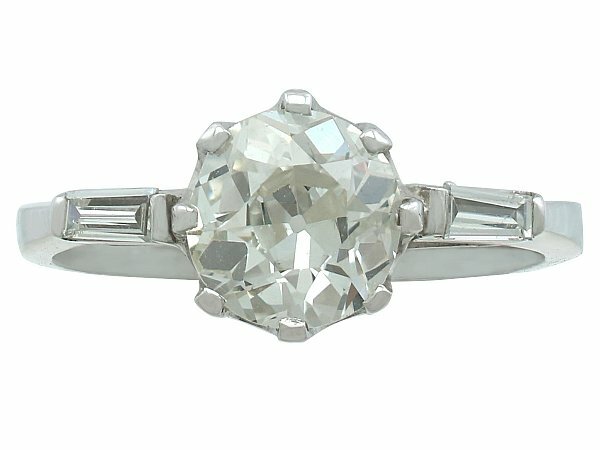 This stunning Art Deco style diamond solitaire ring has been crafted in 18 carat white gold. The solitaire ring displays a feature antique (circa 1900) 1.95 carat Old European round cut diamond eight claw set in relief to the centre of the later Art Deco style contemporary (circa 2000) setting. The pierced decorated, angular ring shoulders are each embellished with a collet set tapering baguette cut diamond. This ring has a plain 18 carat white gold hallmarked shank. The ring shank is clearly hallmarked to the interior with the 18ct hallmark (750), maker's mark 'DOM' and the Birmingham Assay Office hallmark (anchor). This stunning 18ct white gold diamond solitaire ring is supplied with an independent diamond grading certificate for the feature diamond in addition to a diamond grading report card (shown) for the supporting diamonds. This Art Deco diamond solitaire ring is fine quality, set with very high colour graded, very high clarity graded diamonds. The 18ct white gold diamond solitaire ring is in excellent condition and the full English hallmarks struck to the interior of the contemporary shank are very clear. Reflections in the photographs may detract from the true representation of this diamond engagement ring. Width across setting 1.83cm / 0.72"
Height of setting 6.67mm / 0.26"